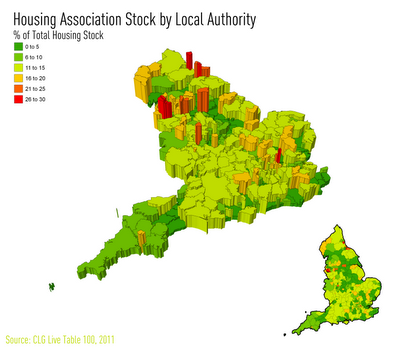 A short while ago I had reason to look into data on housing stock in England at the local authority level. I didn't do much with this but did produce a map and a little bit of preliminary analysis so I thought I'd share it here. The data are from the Department for Communities and Local Government's Live Tables and in particular the series on housing stock for 2010. First of all, a map showing the percentage of housing stock in each local authority that is owned by a housing association. There is so much you can say about the meaning of this kind of data - related to policy, local political context and so on - but just some numbers for now. The local authority with the highest % of stock owned by housing associations is Tower Hamlets, at 29.0% - other high areas are Knowsley (28.6%), Sunderland (28.0), Liverpool (28.0%), Halton (25.6%), Middlesbrough (25.5%) and Manchester (24.7%). So, London, the North West and the North East have the highest values. At the other end of the scale, Castle Point in Essex has only 1.3% of its stock owned by housing associations. Some other numbers... 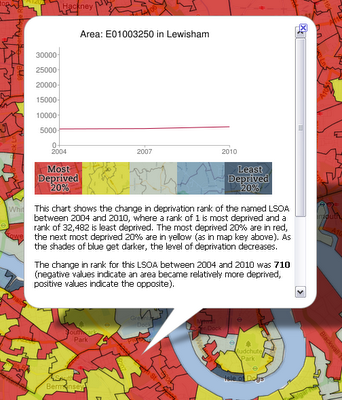 The area with the highest percentage of housing owned by the local authority is Southwark, at 34.1% but this is something of an outlier as the next highest is Harlow at 28.1%. At the opposite end of the scale, many areas have no stock in local authority hands, given the trend for stock transfer over recent decades. What about % private vs. % housing association + local authority owned? Well, in Castle point, 94.6% of the housing stock is in private hands and 93.0% in Medway in Kent. The lowest private % figures are in London, with Southwark (53.1%), Hackney (54.0%), Islington (56.5%), Tower Hamlets (57.8%) and Lambeth (62.4%) occupying the top five spots. Total dwelling stock in England is 22.7m. One further thing... I obtained a detailed list of housing associations in England from the Tenant Services Authority so I produced a fusion table map of it. Individual points on the map are clickable. Click here for the full size version. Link directly to this page here. As you can see from the screenshot above, this info window has a chart (drawn from the Fusion Table which is mapped) an image (a map key) and some text, which also pulls out unique data for each area on the map when you click on it. Since Fusion Tables are relatively new, there isn't an awful lot of information out there on how to do this (at least not info that simpletons like me can understand) so I spent quite a bit of time experimenting with the code behind the info windows. There is some useful information on this page and the pages it links to but when you have your own dataset it can be a bit difficult to grasp. 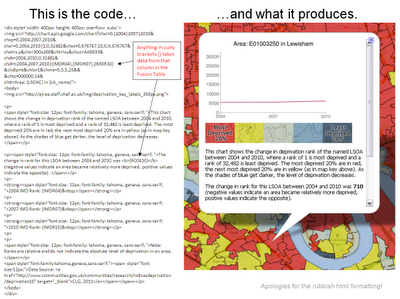 Not much else to say except that I've copied an image below which shows the code and the info window side by side. If you click on the image it should take you to a PowerPoint file which you can then use to copy the code if you wish. I'm certainly no expert but someone may find this useful! The eight English core cities outside London often work together on issues that affect them. 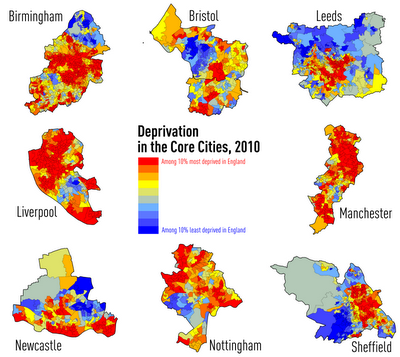 One thing I've been looking at recently on some work in Sheffield is how the core cities compare in terms of patterns of deprivation. So, I've mapped and compared them below. Red areas are amongst the 10% most deprived in England and the darkest blue areas are amongst the 10% least deprived in England. The maps are at different scales but the point here is just to provide a quick visual comparison of cities in this map matrix view. 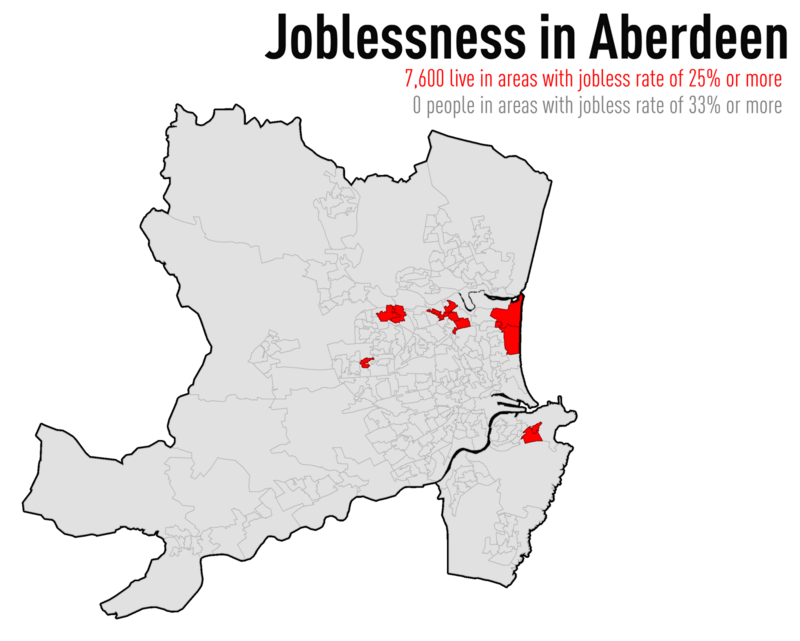 I'm currently finishing off a piece of work relating to spatial patterns of labour market deprivation in Scotland so I thought I'd share a couple of findings about the contrasting cities of Edinburgh and Glasgow*. 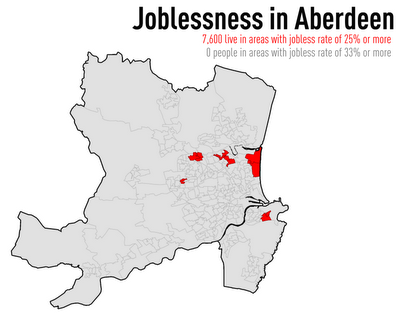 I've been using data from the Scottish Index of Multiple Deprivation (2009) employment deprivation domain, which gives a jobless rate for each small area (Data Zone). The official explanation is that it is 'involuntary exclusion from the labour force' and it includes things like unemployment claimants and incapacity benefit claimants. 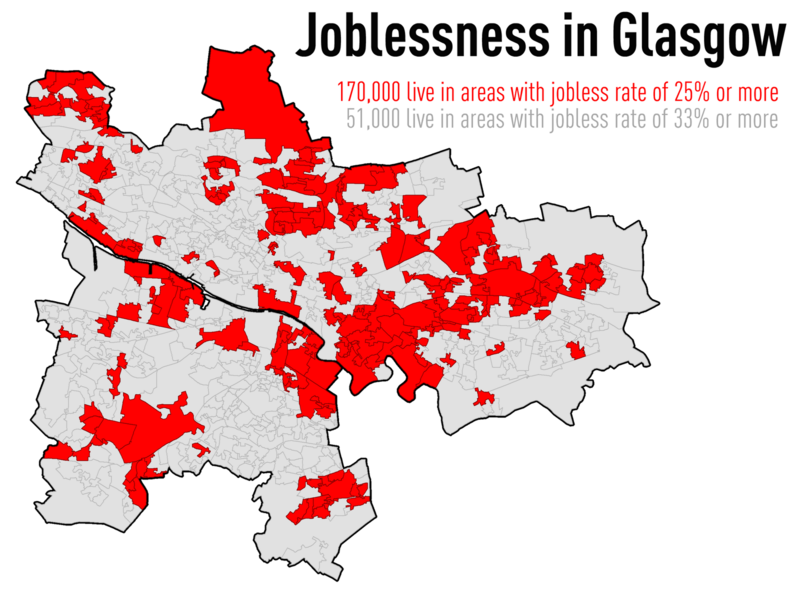 I've been looking at the data within the context of local labour markets and have done some comparisons between Edinburgh and Glasgow. The data are now a bit old (from 2008) but what's really interesting are the numbers... In Glasgow, the total population of Data Zones where the jobless rate was 25% or more was a little over 170,000 (more than the population of Dundee) and areas with a rate of 33% or more contained just over 51,000 people (more than the population of Perth). 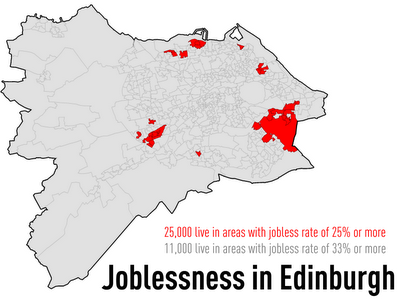 By contrast, the figures for Edinburgh were just under 25,000 and just under 11,000 respectively. 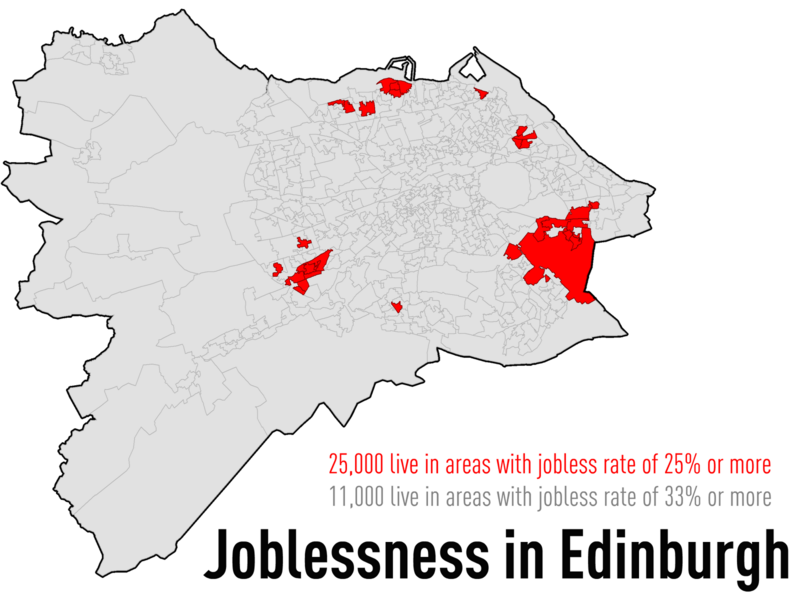 Even when you take into account the difference in population (about 600,000 for Glasgow vs. 450,000 for Edinburgh) that's a big difference! I know this contrast isn't particularly surprising but the numbers did surprise me a bit. 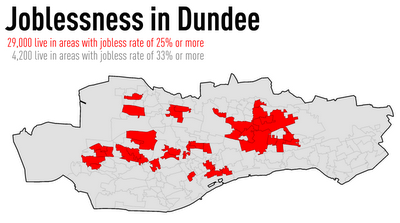 *I've added Aberdeen and Dundee because David Manley suggested it. A good idea!